Cryptocurrencies and the underlying blockchain technology have taken the world by storm since early 2017 and continue to do so today more than ever. A handful of leaders in the blockchain and cryptocurrency worlds have shared their outlook on how these technologies may be impacting our lives in the near future. Made evident by the Ethereum network during the CryptoKitties pandemic, the current state of blockchain-based operating systems encounters several issues regarding scalability, efficiency, and versatility. Due to these drawbacks, several new smart contract platforms have emerged in an effort to improve the original consensus mechanisms and blockchain structures that failed to meet sustainable standards. 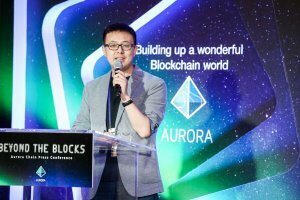 VP and Partner of Aurora Chain, Bo Zhang gives the opening speech at the “Beyond the Blocks” press conference. Of these new projects, Aurora Chain is the most recent, promising up to 2000 TPS (transactions per second). Through DPOS and BFT consensus mechanisms along with improved, select features, such as multi-chain parallel operation and an upgradeable blockchain, Aurora Chain seeks to create a more scalable, secure platform for decentralized application (dApp) development. 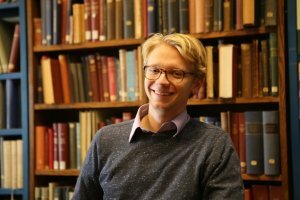 Y Combinator Fellow and Blockchain Enthusiast, Luke Heine is founder and CEO of summerplaybook.com – an international college social network. In the present state of regulation and mass-adoption, it’s evident there is still much progress to be made before common usage of cryptocurrencies and industry-wide blockchain integration become a reality. As cryptocurrency and blockchain technology continue to grow more prevalent, the ideal vision for a truly collaborative, trustless network becomes a real possibility. In addition to the benefit of collective productivity, worldwide blockchain integration enables societies to access and own their personal information – eliminating public dependency on governing bodies for basic, yet necessary knowledge. Still young in the scope of greater development, blockchain and cryptocurrencies are a force for global change and have yet to reach their true potential. Whether blockchain technology will truly improve society and resolve the inefficiencies that plague the present day is still yet to be determined, but the technological progress so far is certainly promising.